The orbit is a complex structure that includes the eye itself along with muscles, nerves, and connective tissue. An orbital tumor refers to any tumor located in the “orbit,” which is the bony socket in the front of the skull that contains the eye. 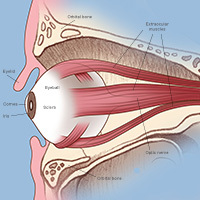 The socket is a complicated structure that includes the eye itself along with muscles, nerves, and connective tissue. The socket is widest in the front and narrows toward the back, where the optic nerve leaves the socket and connects to the brain. Even a tiny tumor in this small, crowded space can cause significant symptoms and functional effects. Larger tumors can cause the eye to bulge forward and cause serious vision problems. Orbital tumors can be benign or malignant, and they can be either primary (meaning the tumor originates there) or metastatic (meaning the tumor represents the spread of another cancer elsewhere in the body). Some orbital tumors occur most commonly in children, other types are more often diagnosed in adults. An orbital tumor can develop anywhere in the orbit. This illustration shows how a tumor in this crowded space may put pressure on nerves, muscles, and the eye itself. An accurate diagnosis is critical to the development of a treatment plan, which may include endovascular surgery, traditional surgery, radiation, chemotherapy, or other medical interventions (see Diagnosing and Treating an Orbital Tumor). The delicate nature of the eye means that only the most expert multidisciplinary teams should evaluate and treat any tumor in the orbit. If surgery is required, either for a biopsy or for resection (removal) of the tumor, only those neurosurgeons with experience and expertise in orbital tumors should perform the procedure (see Surgery for Orbital Tumors). What Causes an Orbital Tumor? Some orbital tumors develop when a cancer in another part of the body (such as breast, lung, or prostate cancer) metastasizes (spreads) to the orbit. Melanoma (skin cancer) may also spread to the orbit. 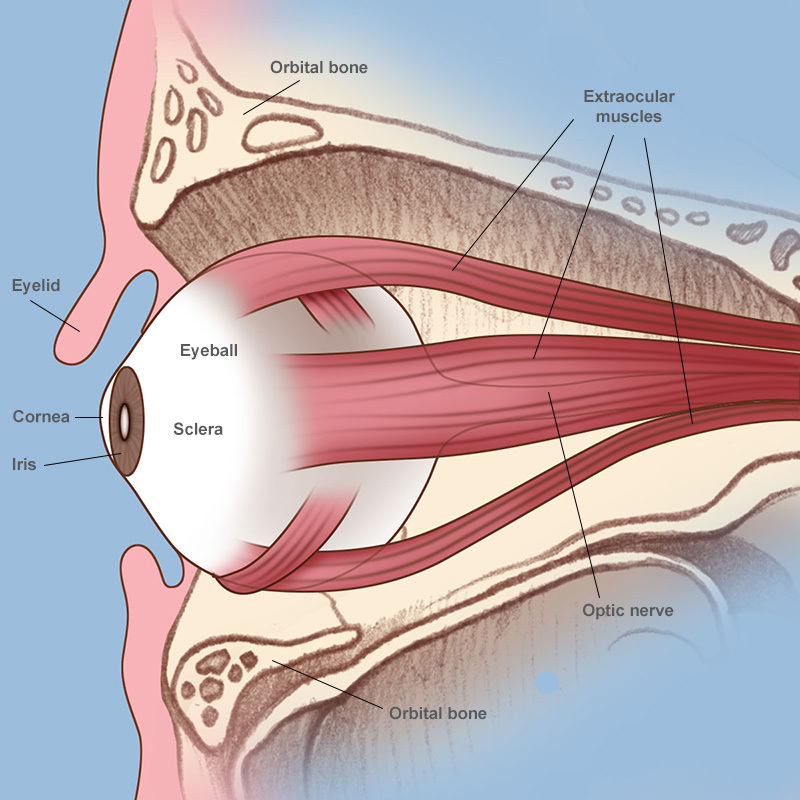 Other orbital tumors are primary, developing in the orbital socket for unknown reasons. Is It an Orbital Tumor, or Graves’ Disease? Graves’ disease and Graves’ disease of the orbit are autoimmune diseases that frequently affect the eyelids, eye socket or orbit, and most of the soft tissues around the eye. The disease invades the fat and muscles in the orbit, effectively acting like a tumor. Both types of Graves’ disease may present with eyelid retraction with a resulting “thyroid stare” and some degree of exophthalmos (excessive prominence of the eyes). Both variants of Graves’ disease can present severe esthetic problems as well as serious medical problems, which when left untreated can lead to a functional loss of vision and even blindness. Reviewed by: Philip E. Stieg, M.D., Ph.D.